Rhetorical construction. The title of this lesson is verbs and active language. What do we mean by this? 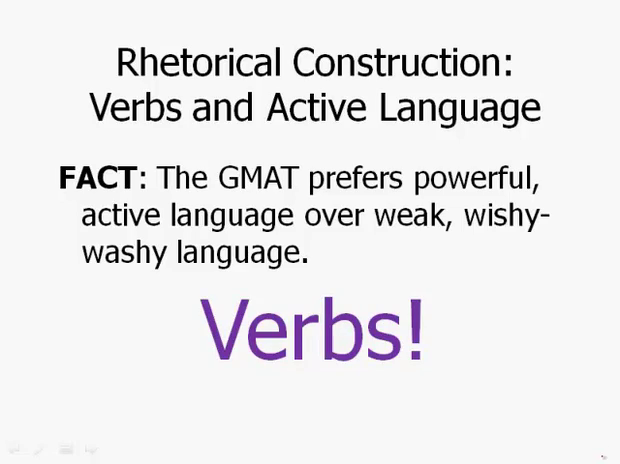 Well, it's an absolute fact that GMAT prefers powerful, active language over weak, wishy-washy language. Now, why? Well, it turns out that this is the language that is most used in the business world. When you think about it for a second, think about advertising, for example. Imagine that we're a company who's advertising slogans went something like this. Well June, maybe you'd like our product, I don't know. Maybe you'd want to give it a try. Something wishy-washy like that, that company would simply go out of business. Advertising has to be powerful and direct. Buy our product, it's the best. Something like that. And much in the same way powerful, effective language is what persuades people, what motivates them to action. And so you'll find this throughout the business world. And so, if we want to make language active, what are the action words of the language? Well, of course, verbs are the active words of the language. Now of course, every sentence is gonna have a verb, but sometimes the GMAT gives us a split, it presents in the same, for the same word it presents the noun form and the verb form, maybe even the adjective form and is having us choose between them. When you have a choice like that, chances are very good that choosing the verb will make the most active and most direct sentence. For example, consider these two sentences: a has a correspondence to b in these activities; a corresponds to b in these activities. Notice that we have the noun form and the verb form, correspondence, the noun, and corresponds, the verb. Now, let's think about this, a has a correspondence to b. That's kind of a long, wordy, indirect sentence. A corresponds to B. Bam. That's powerful and direct. The verb form gives us a much more direct and concise sentence. Another example, blank are illustrative of, blank provide an illustration of, blank illustrate. Here we have the adjective form, the noun form, and the verb form. Now this first one, are illustrative of. That's very fancy sounding. And admittedly, that sounds like something that GMAT would have, and of course there could be sentences in which are illustrative of would be perfectly correct. But if the sentence is actually making us choose, if among the answer choices we have a split between the noun form, the verb form, and the adjective form, chances are very, very good that choosing the verb form will make the most direct and powerful sentence, as well as the shortest, the most concise sentence. So keep in mind, this is not an automatic deciding split. Just because you see a noun form and a verb form, you can't automatically decide, okay, the noun form is automatically wrong. This is more about looking for a pattern. In general, the verb form of a root word will produce a shorter and more powerful sentence than does the noun or adjective form. And this can be a powerful perspective for analyzing sentences on sentence correction.